We took our grandsons Christmas shopping on Saturday to buy presents for their mommy and daddy. 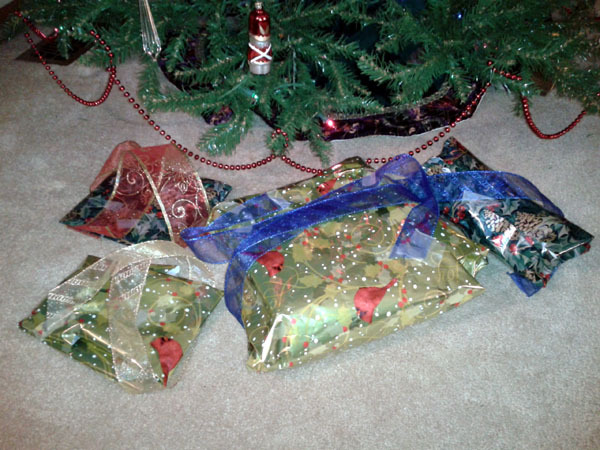 When we got home, they wrapped the presents all by themselves. They picked out the paper and the ribbon. They cut, folded, taped, and tied. Will there be a prettier, more perfectly selected gift under their tree? Nope! Clearly, they know the desires of their mommy’s and daddy’s hearts! We all want to give the perfect gifts, so we ask ourselves: what are the desires of our loved one’s hearts? What will make them happy? What will meet their needs? We look for clues and even ask for specific lists so that we don’t fail in our mission. God wants to give his people the perfect gift also! He wants to give us the desires of our hearts, and he promises that when we take delight in him, he will. So what does it mean to ‘delight in the Lord’? Let’s back up for a moment. When we asked the boys what they wanted to give their parents for Christmas, we delighted in their answer. It made us smile. As they worked so hard wrapping their packages without creased edges or perfect bows it was adorable. We delighted in watching them. It made us smile. Delight is a choice. Delighting in someone is choosing to enjoy them, and accepting who they are and what they do without criticism. It makes us smile. Can you delight in the Lord? Can you enjoy him? Can you accept who He is and what He does without criticism? Can you have joy even in difficult circumstances? The answer is “Yes, you can.” But do you choose to? If you and I delight in the Lord, he says he will give us the desires of our heart. So, should we prepare our Christmas lists!? Or is there a greater desire of our hearts that we should be heeding? There is no gift under our tree this year that will more fully meet the desire of our hearts than God himself. If we choose to delight in Him, then he will give the desire of our hearts; he will bring glory to His name, He will be with us in the night and in the morning. There is no greater gift than God himself! Is He the desire of your heart this Christmas? You mean they did not get Legos and a Sully!!! LOL Those boys are so precious!! Another good read that touches the heart!! God IS all we need and He gave us the greatest gift of all, His Son Jesus, Who gives us eternal life!!! We need to never forget what the true meaning of Christmas is ~~ not just on Dec 25th but every day of the year!!!! Hahaha, nope! No Legos, no Sully! And, you are so right, Janet, we have the greatest gift in Jesus!